Olive oil has been used for more than 6,000 years. According to Adelphi University anthropologist and olive oil producer Anagnostis Agelarakis, olive oil was thought to have divine powers by the ancient Greeks. He tells the Archaeological Institute of America that olive oil was used to anoint athletes during the Olympic Games and was bestowed upon the dead as a ritual burial gift. It was also used to heal a wide variety of ailments, from cuts to concussions. 1. Prevent heart disease. Medical News Today reports diets rich in olive oil lower the risk of heart disease, high blood pressure and stroke. This is because olive oil is a monounsaturated fatty acid, or "good fat," which according to WebMD, means it helps lower cholesterol and is rich in the antioxidant vitamin E.
2. Reduce risk of Alzheimer's disease. You may be surprised to learn that the rate of Alzheimer's disease is lower in Mediterranean countries than it is anywhere else in the world. Medical News Today reports some researchers associate this phenomenon with the region's high intake of olive oil. 3. Protect against liver damage. Yet another study cited in Medical New Today found olive oil can actually protect the liver against cell damage. In other words, a diet that includes regular consumption of olive oil reduces the risk of liver diseases. 4. Moisturize dry skin. Author and host of the AARP YouTube Channel Barbara Hannah Grufferman swears by olive oil in treating dry skin. She says in an article for The Huffington Post, gentling massaging your body with a washcloth treated with olive oil gives you "skin like velvet." 5. Relieve itching. Grufferman further recommends olive oil to treat itching from insect bites, dry skin and other rashes. Spread a few drops of olive oil on the affected area and leave it uncovered. This home remedy has the added benefit of speeding up recovery. 6. Treat minor cuts. Make an antibacterial salve to soothe minor cuts and scrapes, prevent infection and promote healing. This recipe from Live Simply includes olive oil, coconut oil, dried lavender, dried calendula, beeswax pellets, and tea tree and lavender essential oils. 7. Soften cuticles. If your cuticles are dry and brittle, soak your nails in a tray of olive oil as part of a home spa treatment, as recommended by Grufferman in The Huffington Post. 8. Treat dandruff. Just as olive oil is good for dry skin, it's also good for dry hair. Grufferman suggests massaging olive oil into the scalp and letting it soak under a shower cap for a few hours. When you're ready, wash with regular shampoo. 9. Remove makeup. Oil attracts other oils. This is why, according to Allure, olive oil is a wonderful makeup remover. It is gentle enough to use on eyes and has antibacterial properties that may heal acne. 10. Clean out ear wax. Allure suggests flushing the ear with a few drops of olive oil before bed to remove ear wax. This should only be performed for a maximum of three or four nights when you have excessive wax buildup. 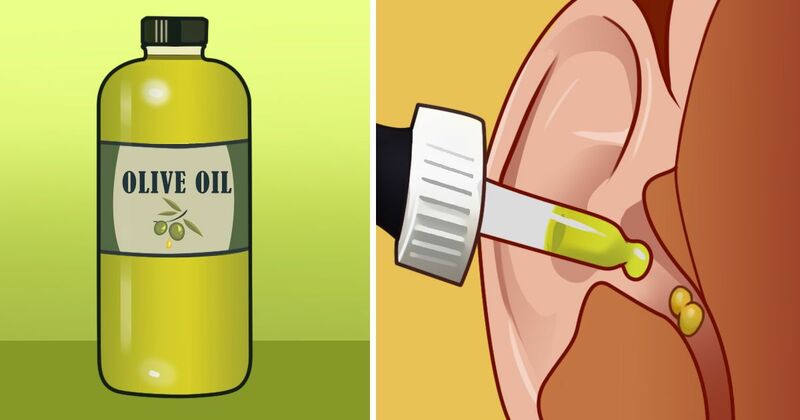 Although some people have found success with this home remedy, you should talk to your doctor before putting anything in your ear. What's your favorite health benefit of olive oil? Tell us when you share this article on social media.